We're off on a spectacular one day bus trip to Peterborough and the Kawarthas, east of Toronto. Our day trip includes a picnic stop at the Ferris Provincial Park, an optional walk across a suspension bridge, a visit to the Ranney falls, a chance to do some chocolate shopping from the factory outlet at World's Finest Chocolates and finally, the main purpose of our tour, a fabulous 3-hour dinner cruise through Peterborough lift-locks with live entertainment. 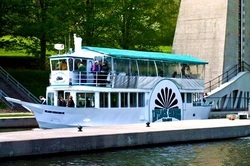 3-hour cruise as we travel through the Peterborough Lift Locks on the Trent-Severn Waterway. Discover the unbelievable beauty of this remote region of the Kawarthas. Experience the entire boat being lifted and dropped 65 feet through the highest hydraulic lift-locks in the world. While we are on the boat!! Dinner on board the boat is included. All drinks are extra. Live entertainment on board the boat. A picnic stop at the Ranney Gorge Suspension Bridge in Ferris Provincial Park, a beautiful setting to sit down and enjoy our picnic. Admission to the park is included in the tour price. Lunch is not included, please bring your own packed picnic lunch to eat at our picnic stop. Short 10 minute walk to see the Ranney waterfalls in the park. A chocolate shopping stop at World's Finest Chocolates. Who doesn't love chocolate?! The highlight of our tour is our private 3-hour dinner cruise aboard the Island Princess III, a double deck replica side wheeler boat. We travel through the Peterborough Lift Locks. If you've never travelled through lift locks before, this should be a very interesting experience for you. The Peterborough Lift Locks are the highest hydraulic lift locks in the world and the boat is actually lifted, gently, through 65 vertical feet, while we are on the boat, to allow us to travel on the Trent-Severn Waterway. We will be visiting Ferris Provincial Park for our lunch stop. One of the most beautiful provincial parks in the province, the park incorporates the Trent River and you have an opportunity to experience crossing a suspension bridge on foot and also to visit the Ranney waterfalls inside the park. We will be visiting Ferris Provincial Park where you will have an opportunity to eat your packed lunch, right next to the Ranney Gorge Suspension Bridge. This pedestrian only bridge hovers 30 feet above the Ranney Gorge just south of the Ranney falls. The bridge is 300 feet long and as you walk across this great expanse your heart pounds as you feel it sway slightly below your feet. Looking down you can see the water rushing by but to the north you see one of nature's gifts, the Ranney Falls in all its glory. To the south you can see the Trent River and the boats as they enter the locks to come into Campbellford. Please note that the walk across the suspension bridge is completely optional and you are not required to walk across the bridge if you don't wish to do so. 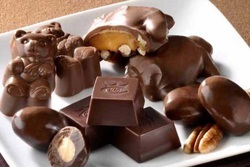 We will also be doing a brief shopping stop at World's Finest Chocolates in Campbellford to allow you to purchase some chocolates from their factory outlet.